No other brand represents the spirited enjoyment of classic American sport and recreation more than PF Flyers®. From timeless court and tennis styles to iconic boots and deck shoes, PF has pioneered some of the most enduring designs in sneaker history. Generations of Americans have made the most of "work, relaxation and play" wearing PF Flyers. Patented in 1933, Posture Foundation insole technology set a new standard in sneaker comfort. Its success grew and in 1937 became the basis for the brand name P-F Flyers. Sport styles by PF were legends of the 1950s, renowned for helping you "Run Faster and Jump Higher." 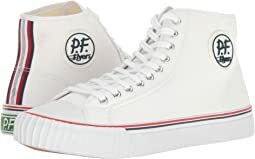 Basketball's first superstar, Bob Cousy created a string of classic court shoes with PF, in the very first collaboration of its kind. The green PF heel patch remains the unmistakable symbol of quality and the American spirit of play. In authentic reissues and modern classics, PF's heritage of clean-lined design, premium materials and Posture Foundation comfort continues to create milestones of sneaker style in every era! Look great and feel good but form fitting. 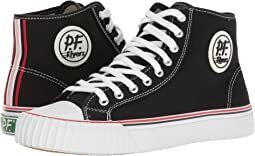 If you like Converse All Stars you should like PF Flyers. Sizing is a little different. I wear a 11 1/2 and Converse states buy a 12. 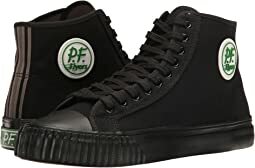 You can buy PF Flyers in a 12 but they will fit like a 11 1/2 shoe. Much more comfortable than converse Chuck's! Like em ALOT. Very happy. The way the toe area was designed, it seemed off to me. Not modern at all???? I have a wide size 12 foot. The size 12 fits perfectly and is very comfortable for a non-running type casual tennis shoe. These are not ASICS running shoes so don't think you're getting that. Arch support is as good as my Echo casual tennies. Remember, PF stands for posture foundation. Got these for my son who finds away to obliterate all his shoes in a school week. We will see how these hold up. The fit is good and laces are right size for the shoes purchased. Nice heavy duty canvas and the front of the toes have extra material for the kicking and running. Thicker padding in the shoes compared to similar styles. 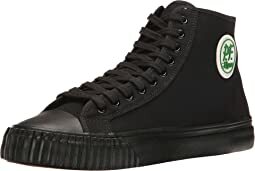 I have been buying PF Flyers for the past 10 years, I have always purchased a 12.5, they myst have switch manufacturers as they suddenly changed the size and fit. I now have to buy a 13. These shoes weigh a lot and they are not comfortable. My heel slipped and I felt pain across the bridge of my foot. Had to return them. I love the look of these shoes. I had previously worn Rambler Lows, which seem to have been discontinued. I thought these would fit exactly the same but they're more narrow. I normally wear a 9.5 and the 10 fit perfectly, so they run about a half size small. I was pleasantly surprised with how comfortable the shoe felt the very first time I wore them, which was over the course of an entire day. The style is classic with with subtle blue and red striping. Definitely my shoes for next Fourth of July! I am very flat footed so the arch support for me is great. My feet are wider than a medium width but do not need and extra wide shoe. These fit very comfortable and am planning on getting another pair in another color. They fit much better than chucks and did not need to size up like I do with chucks. Will continue to buy more of these. 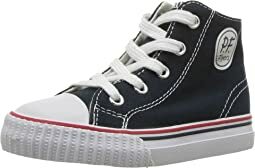 I love the ways these look, and they honestly don't feel any WORSE than Converse Chuck Taylors, but I hate the way they are wider around the top of the sneaker on the hi-tops. 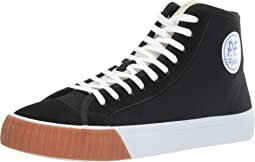 I'm tall and thin, and my ankles are skinny, so I have the issue where when these are laced all the way to the top, and I pull the laces tight as far as they'll go before tying them (so that the two sides of the shoe come together over the tongue), there is still a lot of room left between the hi-top and my ankle. This just feels (and looks) weird. So I guess if you have really big or fat ankles, these would work great for you. If that doesn't work, then try Pro-Keds Royal Hi's for a good Chuck Taylor alternative that fits better. 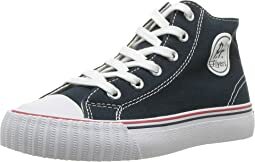 I was always intrigued by these, having had Converses all my life and enjoying them. Ultimately I felt that these were generally poorly constructed and they felt like a Converse rip-off to me. They were not terribly comfortable and were wider than I expected, but smaller in overall length. Maybe I just got a weird pair. I ended up returning them almost immediately, Zappos was excellent about returns as usual. I bought these alongside the Chuck 70s and ended up keeping them, though they were pricier, the difference is evident in the quality. Love these shoes! Very comfortable, stylish and fun! I really, really wanted to love these shoes and was so excited to get them - but these shoes (I ordered a pair of black and a pair of white) are really not very nice in many ways. I wore Converse for years but stopped because of the horrible support - or the complete lack of support. 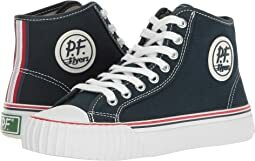 I read lots of reviews and even watched videos about the PF Flyers. That they come with an arch support and a removable insert was a big selling point - and they seemed a bit edgier that Converse. Then they came - hmmmmmm. Not too impressed out of the box. The toe housing seems really stunted giving the shoes a childlike shoe appearance - not in a good way. Then I tried them on. They ARE like children's shoes in appearance - but the worst part is that they fit a full, solid, complete size smaller than Converse - maybe more. The other thing I did not like about the flyer is that the stripe around the base and toe is very thin and weak compared to Converse. In my experience, the shoe was a total bust. I am at a disadvantage regarding comfort because the shoes I ordered (I ordered the same size as the Converse I own) were so, so small. If you love the look and choose the Flyers - think really big size wise - But I guess I am now officially a Converse cat, too bad because I was willing to Fly. I am a Flyer's convert, and if you're thinking about switching from Converse, order your normal size. They run pretty much the same. Overall, the quality is nice and I think the sole is much better quality than Converse's. And I love the PF flyer's decal on the ankle of the shoe. These are my first pair of hi-tops, so i'm learning to get used to the feeling of something wrapped around my ankle, but they look great with everything (yes, including shorts). If you're looking for something that is as versatile as it is stylish, get these! Be warned, however, that they offer very little arch support for those flat-footed people out there. Returned as it ran about a 1/2 small. Reordered 1/2 bigger, they fit great and are comfortable. I wear an 11.5, an 11 in Chuck's and after some experimenting I wear a 12 in Flyers. They're more comfy than Chucks IMHO and will be ordering many more pairs. I hope this helps. My niece looved her shoes. Put them on the moment I gave them to her!! Awesome, we bought 2 pairs. Grandsons love them. I have extra wide feet and these fit perfect. Wider mid and toe box than Cons. I've also gotten many compliments on them from people reminded of their childhood. Great conversation starter!